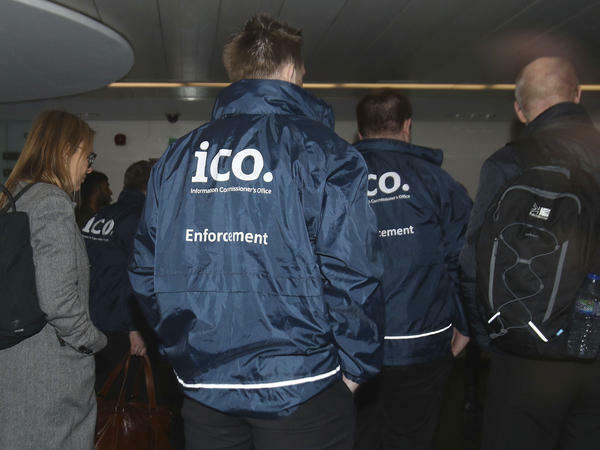 Officers from the Information Commissioner's Office enter the offices of Cambridge Analytica in central London. The investigators had a search warrant as part of what has been reported to be a broader investigation into possible ties between Cambridge Analytica and the campaign for the U.K. Brexit referendum. Investigators with Britain's information commissioner searched the London headquarters of Cambridge Analytica on Friday amid reports that the firm harvested the personal data of millions of Facebook users as part of a campaign to influence the U.S. 2016 presidential elections. The move comes after a British High Court judge granted a warrant to the data watchdog Information Commissioner's Office, allowing its investigators to search the firm's offices. The search is reported to be part of a broader investigation into possible ties between Cambridge Analytica and the campaign for the U.K. Brexit referendum. "Information Commissioner Elizabeth Denham has said she was looking at whether personal data was acquired in 'an unauthorised way', whether there was sufficient consent to share the data, what was done to safeguard it and whether Facebook acted robustly when it found out about the loss of the data." The search was conducted by more than a dozen people wearing jackets identifying them as ICO personnel, according to The Associated Press. The Guardian reports that a former Cambridge Analytica business development director, Brittany Kaiser, said that the firm provided data analysis for Leave.EU. "Cambridge Analytica conducted data research for one of the leading Brexit campaign groups and then misled the public and MPs over the work the company had undertaken, according to a former employee who has spoken to the Guardian." "Kaiser's revelations will reignite a fierce argument about the tactics used to try to influence voters in the Brexit campaign – and will add to the pressure on Alexander Nix, the [suspended] CEO of Cambridge Analytica. The company is already under investigation by the Electoral Commission over what role, if any, it played in the EU referendum campaign." A spokesman for Leave.EU, Aaron Banks, denied the claim, saying that his group did not receive any data or work from Cambridge Analytica.